In Leadership and Change: A President’s Story, G. Douglass Lewis, president of Wesley Theological Seminary from 1982-2002, shares an amazing turnaround story — of a seminary on the brink of closure that grew to a position of prominence among theological schools. 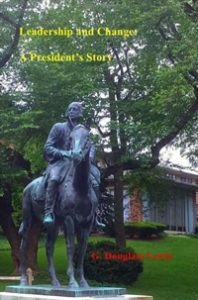 The book recalls how Wesley Seminary, under Lewis’s leadership, pulled through the crisis by building a community of dedicated people united by common purpose. Lewis’s first-person narrative recounts his challenges and successes as he navigates the terrain of institutional leadership. He shares his wisdom on dealing with faculty, programming, finances, and governance. Humorous vignettes enliven the facts and figures of this remarkable story. Leadership and Change is an in-depth case study that is offered as an inspiration and guide to other leaders in theological education, religious institutions, the church, and beyond. In this account of Doug Lewis’s long and successful tenure at Wesley, readers will find a personal and practical witness to the kind of adaptability, vision, and tenacity required in the face of today’s institutional challenges. Dr. Lewis is teaching an online continuing education course on Leadership and Fundraising based on this book. It is offered through the UMC Cyber Campus May 23-25. Please view the introductory video below and learn more at umccybercampus.com/leadership-fund-raising. G. Douglass Lewis, for whom the Lewis Center for Church Leadership is named, was president of Wesley Theological Seminary from 1982-2002. Since retirement, he has consulted widely with seminaries in the areas of governance, leadership, strategic planning, and development.